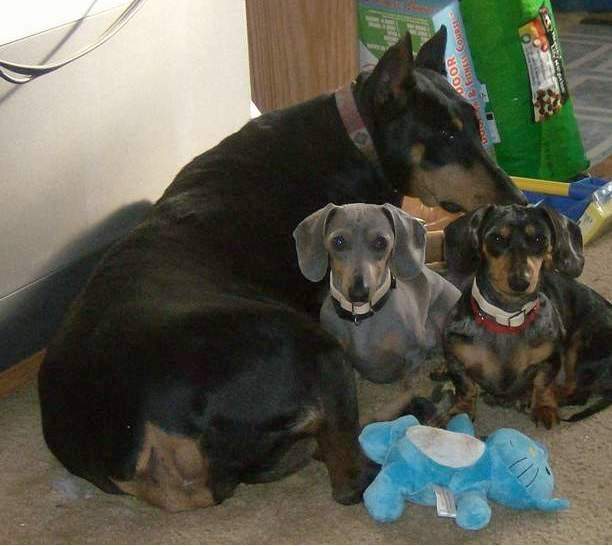 Doxies are hunting dogs. They don't always know what they're hunting, but if you keep your nose to the the ground you never know what will turn up! Sparky's favorite bed is Jazz's back. You may notice Cally is never without one of her toys. Wherever she is, there's a crazy eyes toy! Pooh and the girls give new meaning to the term "couch potatoes'. Yeah...that's Annie again. She's an indoor/outdoor kinda girl. The others are, left to right: Sparky, Jelly Bean, Cally and Nikki. 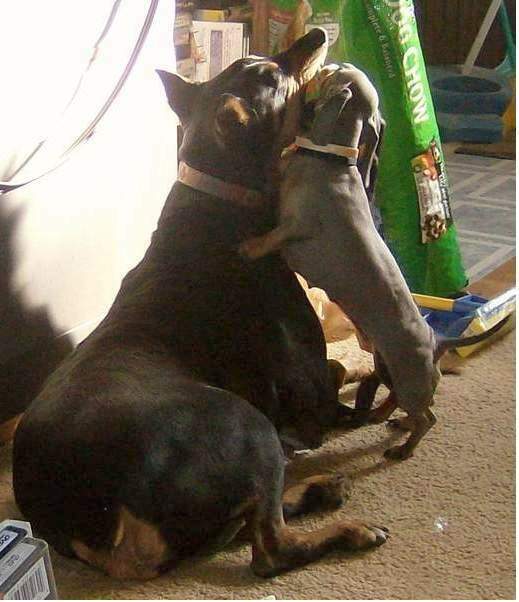 Doxies are very fastidious about dental work..on the Doberman as well as each other LOL. If you count legs, you'll find Jazz is being double-teamed by Sparky and Cally. As soon as they realized I had the camera, Cally hurriedly grabbed her toy and she and Sparky posed in front of their 'dental patient'. Jazz was just happy I distracted them LOL. This is one of our favorite hot weather games. Even my grandson's chihuahua mix likes to come and play in the wading pool with the Doxies on hot days. I toss treats into the pool and they fish them out :) They take breaks now and then to dry off. Cass usually looks more like a drowned rat than a Doxie because this is his absolute favorite place to play with or without treats! Willow will attest to the fact that if you don't like water you can have just as much fun rolling in the grass.